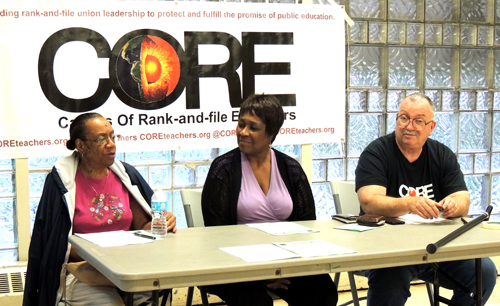 CORE, the Caucus of Rank and File Educators that is currently helping to lead the 30,000-member Chicago Teachers Union, hosted its fourth and final forum on the history of teacher strikes in Chicago at Chicago's Foster Park (1440 W. 84th St.) on the evening of August 29, 2012. As had been the case all summer, the forum panel consisted of retired teachers who had served in the union during the strikes of the 1960s, 1970s, and 1980s. The August 29 forum featured retired teacher and retiree delegate Leandres White, retired teacher, retiree delegate, and chairman of the CTU retiree group Pat Knazze, and this reporter (retired teacher and retiree delegate George Schmidt). Retired Chicago teachers and union delegates (left to right) Leandres White, Patricia Knazze, and George N. Schmidt discussed the history and victories of the strike led by the Chicago Teachers Union at the final CORE Successful Strikes forum at Foster Park on August 29, 2012. Substance photo by Nate Goldbaum.After an introduction going over briefly the history of CTU strikes and the distribution of a two-page outline history (see below) of the ten strikes by Chicago teachers, each of the panelists spoke about their own experience during the strikes. These personal experiences were a highlight of each of the Successful Strike events by CORE during the summer preceding the Chicago teachers' strike of 2012. Leandres White told the forum that her first strike, in 1971, came when she was teaching at Gage Park High School. She reminded the forum that in those days, the Gage Park union staff was united and not racist, but that extreme racial problems existed in the community. (Marchers during the 1960s with Dr. Martin Luther King Jr. had been attacked in Gage Park, Marquette Park, and in the township of Cicero by large white mobs, and the hostilities continued into the 1970s in many Chicago communities). Following her time at Gage Park, Ms. White spent most of her career teaching at Chicago Vocational High School (now temporarily called "Chicago Vocational Career Academy...") and noted that the picket lines at CVS were very strong because of the number of shop teachers at the school who had come from a tradition of unionism in the trades. Pat Knazze told of the difference on the picket lines at Ray Elementary School in Hyde Park, where she had taught for nearly two decades. Her first strike was in 1973, although she had been a student teacher during the 1971 strike. Ms. Knazze told of a solid union elementary school whose students included the children of University of Chicago professors, on the one hand, and (in the upper grades) very poor families from the Woodlawn community, on the others. Ms. Knazze reported that during the strikes she was on, she became a picket captain and helped coordinate the picket lines in 1975, 1980 (the strike that followed the "payless payday" of Christmas 1979), 1983, 1984, 1985 and 1987. She told the story (reported elsewhere in Substance and at substancenews.net) of how in 1983 General Schools Supt. Ruth B. Love tried to play the race card against the CTU and was thwarted following an hysterical outburst to the media after she crossed the picket line at Dixon Elementary School in October 1987. I worked to frame the histories of the Chicago Teachers Union since it achieved collective bargaining and to highlight the importance of the union's early and successful struggles against the racism and white supremacy of Chicago and the Chicago Board of Education. Strikes by Chicago teachers, 1930s through the 1980s. 1930s. The organizations of Chicago teachers were still scattered and did not merge into the Chicago Teachers Union until 1937, but they organized major protests against the pillaging of the city’s schools during the Great Depression. When World War II began, CTU President John Fewkes took a position with the federal government, and the union became a part of the war effort. By the time the war ended, however, Chicago corruption in was so great that the entire system was almost decertified — and a wave of “reform” began. 1940s and 1950s. John Fewkes is CTU President. Martin Kennelly and Richard J. Daley Chicago’s mayor. The CTU exists without a written contract. The national offices of the American Federation of Teachers (AFT) were also located in Chicago during those years. 1967. Chicago Teachers Union becomes the exclusive bargaining agent for the initial groups listed in Article 1 of the Agreement (the contract). First contract is negotiated without a strike, after union votes to strike and the mayor brokers a settlement at the last minute. The first contract raises pay by $1,000 per year. 1968. Chicago teachers under the leadership of “Concerned FTBs” strike at more than 100 schools against racist certification procedures and school segregation. The CTU declares the strike a “wildcat” and most union teachers cross the picket lines (although the strike is successful in building solidarity in many inner city schools). 1969. Two day strike. John Desmond, CTU President; James Redmond, General Supt. Of Schools; Richard J. Daley, Mayor. Strike wins a salary increase of $100 per month, employment of teacher aides, two duty-free prep periods for elementary teachers, and class size maximums of 30 – 35 (depending upon the grade). 1971. Four day strike. John Desmond, CTU President; James Redmond, General Supt. Of Schools; Richard J. Daley, Mayor. The strike wins an 8 percent raise for each of two years. (The Board begins its habit of reneging on raises by reneging on the second year’s raise). CPS also agrees to pay 100 percent of family health insurance for regular teaches and members. 1973. Twelve-day strike. Robert Healey, CTU President; James Redmond, General Supt. Of Schools; Richard J. Daley, Mayor. The strike wins a 2.5 percent raise; a 39-week school year, class size reduction, supply money for all teachers, and improved preps. 1975. Eleven day strike. Robert Healey, CTU President; Joseph Hannon, General Supt. Of Schools; Richard J. Daley, Mayor. The strike wins a 7.1 percent raise. Additional wins include further reduction in class size; maternity benefits improvements; paid dental insurance. Hannon closes the schools 16 days early in June 1976. 1980. Ten day “strike.” Robert Healey, CTU President; Angeline Caruso, Interim General Supt. Of Schools; Jane Byrne, Mayor. After going without a paycheck since Christmas (“the school financial crisis of 1979”), teachers stop working for five days, then strike for five days, reducing some of the cuts forced on CPS by the School Finance Authority (which will last until 2010). 1983. Fifteen (13?) day strike. Robert Healey, CTU President; Ruth Love, General Supt. Of Schools; Harold Washington, Mayor. The strike wins a six percent raise in the first year and three percent in the second. Improvements also include improved sick leave and maternity/paternity leaves. 1984. Ten day strike. Jacqueline Vaughn, CTU President; Manford Byrd, General Supt. Of Schools; Harold Washington, Mayor. Strike wins a 4.5 percent pay raise in major medical and PAC checkoff. 1985. Two day strike. Jacqueline Vaughn, CTU President; Manford Byrd, General Supt. Of Schools; Harold Washington, Mayor. Strike wins a six percent pay raise in the first year and three percent in the second. Improvements include improved sick leave and leaves. 1987. Nineteen day strike. Jacqueline Vaughn is CTU President; Manford Byrd, General Supt. Of Schools; Washingon Mayor. The strike wins raises of six percent (first year) and three percent (second year) plus increased sick day bank and improved major medical. All strike settlements included make-up days for days lost on strike. Compiled by Paul Odell, Helen Ramirez Odell, and George N. Schmidt for CORE, www.coreteachers. Org. August 2012. The August 29, 2012 Foster Park event culminated a summer of "Successful Strike" forums provided to CTU members and others by CORE. The forums all featured teachers and (mostly) retired teachers who had been leaders during the strikes of the CTU between 1969 and 1987, and included some reports of the strike of 1968, which brought the union towards a major goal of breaking the racist system of teacher certification that had plagued Chicago for decades.